One of the reasons we started diving over fiften years ago was getting full value from one day visiting the Great Barrier Reef. Even twenty years ago, we knew we were coming, we just didn’t know when. We finally arrived. 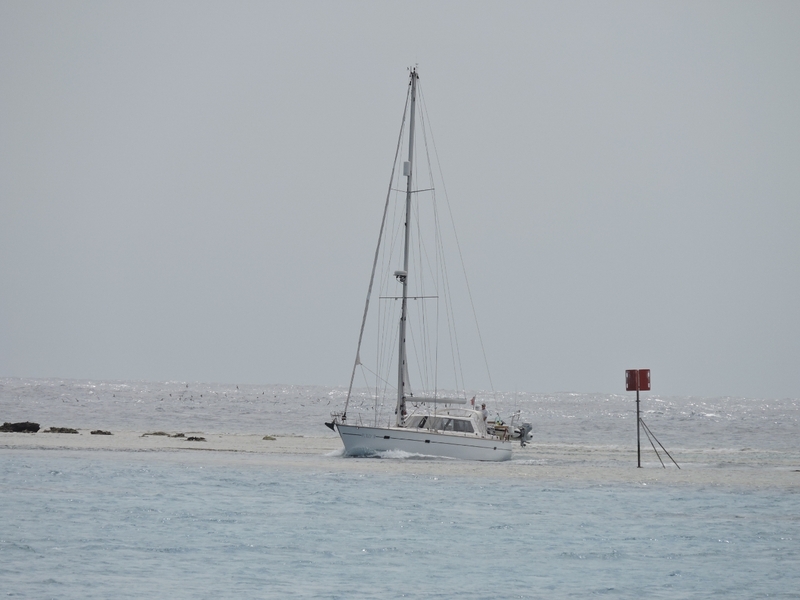 Our first dive was at Lady Elliott Island, the southernmost reef in the chain that makes up the Great Barrier Reef. We had a great dive–visibility was excellent, the coral life was good, and we saw a white-tip reef shark, a turtle, a huge wrasse, and many other fish of all sizes. The highlight of the dive was Lady Elliot’s famous Blow Hole–a 20′-diameter swim-through lined with coral and packed with fish. From Lady Elliot Island, we worked north to Lady Musgrave Island, Fitzroy Reef and Heron Island before running east to the Swain Reefs, the southernmost of the outer reefs. 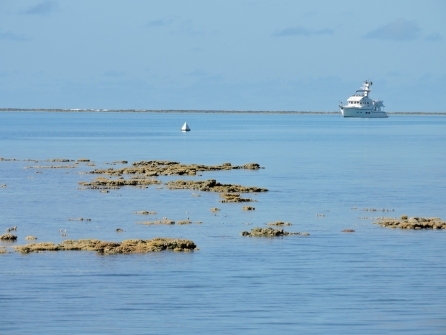 Lady Elliott and Heron Islands were the only anchorages where we didn’t navigate inside a coral reef. 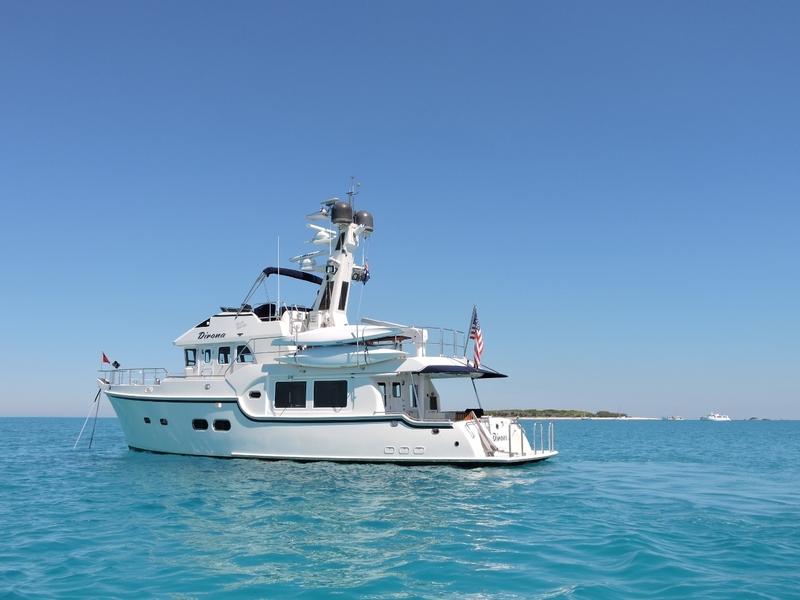 Anchored in the turquoise waters of the reef lagoons felt just like being back in the Tuamotus in French Polynesia, and Beveridge Reef in the central South Pacific. The visibility through the water isn’t quite as good, but it’s the closest we’ve seen. 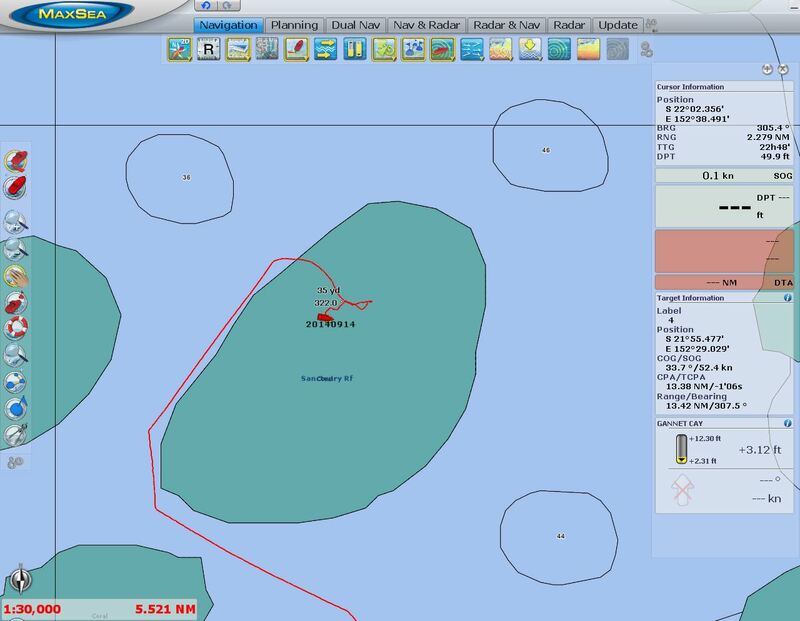 Lady Musgrave Island (below left) and Fitzroy Reef (below right) had marked entries that were narrow, but reasonably easy to follow, and a fair number of boats at each. The Swain Reefs are more remote—we never once shared an anchorage and saw only a handful of other boats the entire week we were there. The reef entries in the Swains were quite narrow, with no marked channels. We navigated to these narrow, unmarked channels using a combination of the chartplotter and a tablet app that shows our position on the satellite imagery. Both C-Map and Navionics charts show only a rough approximation of the reefs and their location. The satellite imagery often was more helpful. 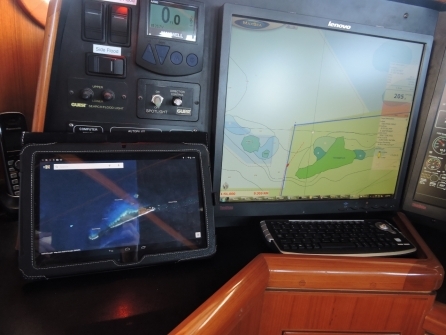 In these tight spots, visibility is key since there is no chart detail and, even if there was, counting on GPS accuracy down to ten feet is not safe. We run with Jennifer on the bow and James at flybridge, both wearing polarized sun glasses. We carefully maintain a safe exit plan at all times, and then go slow and discuss every detail. We prefer to enter when the sun is over-head, or somewhat behind, to avoid glare and have the best visibility to underwater hazards. If you do enter with the sun behind, you have to be extra careful to keep track of where you are in case conditions are unsatisfactory inside. If you have to leave, you’d be going into the sun and glare. 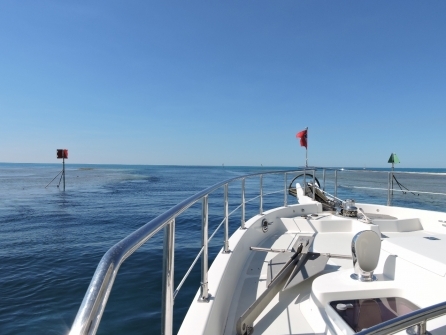 Managing the boat is harder in significant wind but, even before that becomes a problem, the chop in the water makes it hard to resolve depths. So these operations need to be done in favorable wind conditions. We creep in slowly, have the thrusters ready–which are fairly effective at very low speeds, and don’t commit to an entry until we are convinced we have full control and like the conditions. 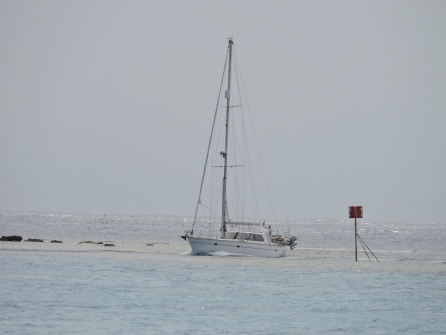 The photo sequence in the video below shows us navigating into Frigate Lagoon in the Swain Reefs. None of the reefs we anchored at in the Swains had any land, but the reefs themselves provided reasonably good swell protection. We loved the wildness and remoteness of the Swain Reefs and had a great time exploring by dinghy and also did several excellent dives there. The first video below was taken at Sanctuary Reef. The seascape there was surprisingly complex, with narrow swim-through channels lined with coral. 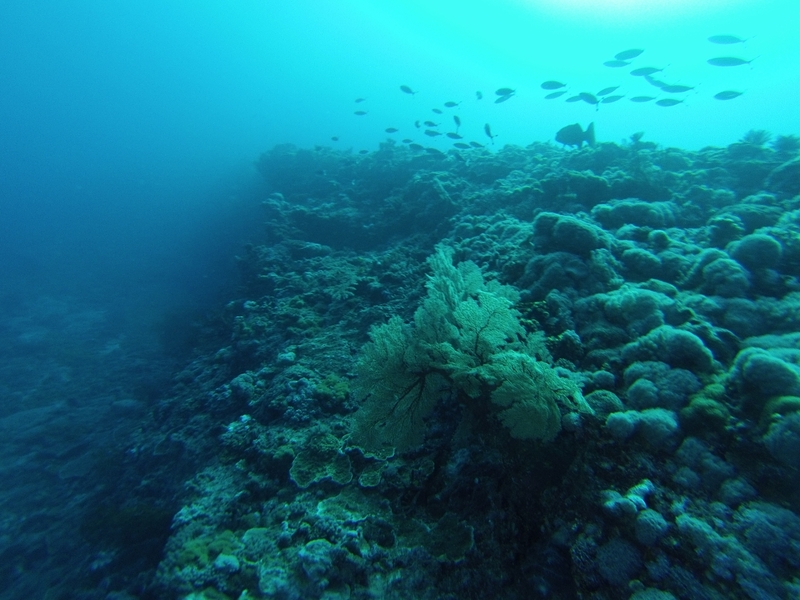 The second video is our favourite Swain Reefs dive at Horseshoe Reef. We started out swimming through coral channels encrusted with hard coral, swam over a forest of staghorn coral, and then worked along a 60-foot wall layered with coral. Click the travel log icon on the left to see these locations and more on a map, with the complete log of our cruise through the southern Great Barrier Reef. On the map page, clicking on a camera or text icon will display a picture and/or log entry for that location, and clicking on the smaller icons along the route will display latitude, longitude and other navigation data for that location. And a live map of our current route and most recent log entries always is available at http://www.mvdirona.com/maps/LocationCurrent.html. Thank’s for saying Hi Shawn. I do remember that AFCOM meeting — that goes back a ways now! I agree that underwater UAVs would really open up some new and very interesting teritory either where it is too deep to easily SCUBA dive or conditions aren’t great. The same is true with umanned air craft as a way to explore more of the surrounding area from above. Enjoy your charter in December. The San Juan Islands and Gulf Islands are a great cruising area. Hi James and Jennifer – I’ve been lurking since I met James at a Seattle AFCOM meeting a few years ago and decided I was long overdue in expressing my appreciation for both of your work. The Dirona blog has been a source of great information as well as inspiration. 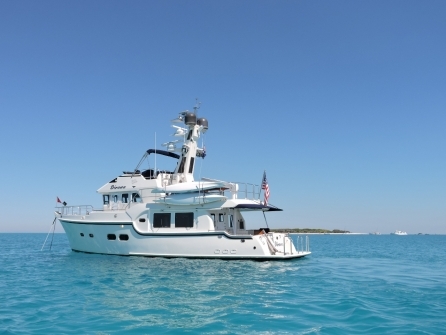 My wife and I are going out on our first charter in December on a boat that we think we’re interested in buying and are using your book, Cruising the Secret Coast to select some of our destinations. This post on TGBR is one particularly inspiring as it’s also one our goal destinations (along with about every other islet and atoll I. The Pacific and Indian Ocean!) and seeing how your addressing the navigational challenges is just fantastic. One of the tools I’ve been thinking could be useful for just this sort of thing is one of the UAV camera platforms. Seems like it could provide a perspective that would be otherwise unattainable, including the breaking side of waves without being exposed to them. Thanks again for sharing so much of yourselves and your adventures!